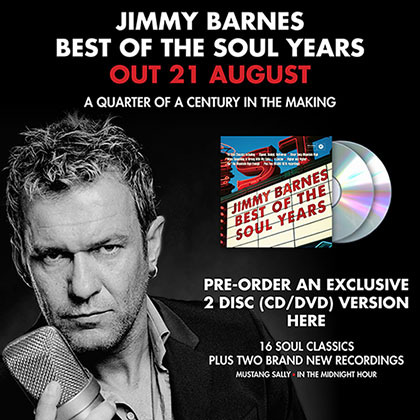 A quarter of a century in the making, here is Jimmy Barnes Best of the Soul Years. Collected here for the very first time, it’s all the highlights from Jimmy’s ongoing artistic pilgrimage into the music and songs that inspired him to become a singer in the first place. 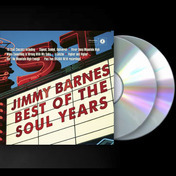 Compiled from his three mega-platinum-selling albums of soul and R&B classics, being 1991’s Soul Deep, 2000’s Soul Deeper and 2009’s The Rhythm and the Blues – each and every song here is a certified classic hit in its own right, and all have been given the inimitable and unmistakable Jimmy Barnes treatment. With so many of these songs, Jimmy has made them so much his own, it’s easy to forget they weren’t his in the first place. A few have become cornerstones in his eclectic career, such as ‘(Your Love Keeps Lifting Me) Higher and Higher’, ‘Ain’t No Mountain High Enough’, ‘Signed Sealed Delivered (I’m Yours)’ and his chart-topping duet with John Farnham, ‘When Something Is Wrong With My Baby’. And just to add some extra cream to this cake, two brand new recordings have been added to this collection – Jimmy’s celebratory interpretations of the Wilson Pickett classics, ‘In the Midnight Hour’ and ‘Mustang Sally’. Jimmy cut both tracks during his recent trip to Nashville to record the fourth album of the Soul Series. Due for release in early 2016, Soul Searchin’ has been produced by Kevin Shirley and is the final instalment in this extraordinary sideline to Jimmy’s solo recording career. It’s almost unfathomable to believe this journey began some 25 years ago, around Christmas 1990, when Jimmy and producer Don Gehman began laying down tracks in Jimmy’s home studio in Bowral NSW. There was no masterplan at that time, no intention to even release anything. It was just meant to be a bit of fun, jamming on the music they loved. If anything, it provided an antidote to Jimmy’s hard rocking, hard living, high stress solo career throughout the 1980s which, to that point, had produced an unprecedented five straight number one albums. Once they got into the different groove, however, Jimmy and Don felt they were onto something. But with one of his landmark rock albums (Two Fires) scheduled for release that year it wasn’t until a year later, in November 1991, that Soul Deep finally saw the light of day … and it soon became the biggest selling album of Jimmy’s career, with sales over the 800,000 mark. It was supported by a massive 18-month Soul Deep tour, by which time Jimmy was ready to rock again. Which is why it took almost another decade before Jimmy produced the sequel, 2000’s Soul Deeper. Again with producer Don Gehman, the album was made in the US with a stellar list of tried and true musicians who had played on the original soul recordings of people like Stevie Wonder, The Temptations, Booker T & The MG’s, Ray Charles, Aretha Franklin and Marvin Gaye back in the 1960s and 70s. And then again, another nine years later, Jimmy decided he wanted to go deeper again, exploring the music that actually gave birth to the soul music that he loves, which produced 2009’s The Rhythm and The Blues which delivered Jimmy his ninth #1 solo album (last year’s 30:30 Hindsight made it ten solo number ones in total). Make no mistake – Jimmy Barnes: Best of the Soul Years is a straight up party record. Classic soul hits performed by Australia’s most celebrated singer. For pre-order only, we’ve put together some fan packs on the SFR store, which includes a double disc CD/DVD that won’t be available through other retailers. CLICK here to head through to the store.